Limo hire and party buses for hire in Cardiff & South Wales. Choose from the largest selection of limos, party buses, wedding cars & luxury transport hire options around Cardiff. For the most competitive deal on chauffeur driven limousine hire anywhere in the Cardiff or South Wales area, don't go anywhere else. We are proud to offer our clients throughout the South Wales and Cardiff region highly affordable limo hire services so if you need to hire a limo in Penarth or Pontyclun, St Mellons or Taff's Well, Llandaff or Whitchurch, Grangetown or Splott, Bridgend or Newport, Llantrisant or Heath, Roath or Cathays, Caerphilly or Ystrad Mynach, we can offer you the benefit of our expert limousine rental services. Whatever the occasion, we've got the limo to match. If you're travelling to a school prom in the Cardiff area, then take a look at our extensive range of party buses with onboard LED dance floors, and our impressive selection of hummers limos, all of which are available to hire in a wide range of colours including hot pink, yellow, blue, orange, black, silver and white. If you're planning to tie the knot in Cardiff, then when it comes to finding just the right wedding car to transport you on your very special day, we've got it covered. Whatever your style or budget, you'll find your perfect wedding car in Cardiff when you view our stunning selection of handpicked vehicles. Choose from the latest modern wedding cars such as the Rolls Royce Phantom and the Baby Bentley limousine, to classic vintage wedding cars such as the open-top Beauford and the elegant Daimler limo. We pride ourselves on offering the most competitively priced limousines in Cardiff so if you're looking for a great deal on luxury travel, there's no need to look elsewhere. 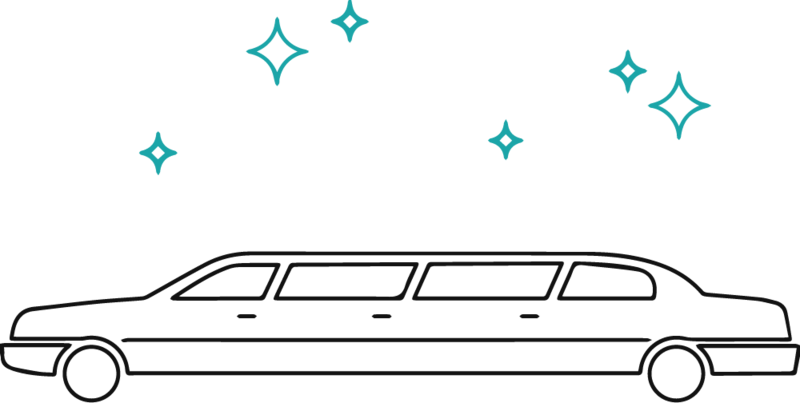 We continually monitor our limousine rental rates to ensure they offer the best affordability for our customers in South Wales - we guarantee you won't find a better limo at a cheaper rate anywhere else in Cardiff. All of our limos are driven by smart, fully suited chauffeurs who will go above and beyond the call of duty to ensure your occasion, whether it's a prom, wedding, birthday, anniversary, hen or stag party or corporate event, is nothing short of perfect.